Let me deal first with what they have presented as their most damning evidence, the pictures of the dead body of Prabhakaran’s son. The killing of a child is always shocking and, unlike the celebrated Elie Wiesel, who excused the killing of members of Osama bin Laden’s family on the grounds that ‘it was bin Laden himself who placed them in harm’s way’, I do not think that is in any sense an excuse. We must investigate what happened, and take action if this was execution. However the manner in which Channel 4 drums up evidence suggests that they are more concerned with vindictiveness towards their enemies than justice. In their anxiety to declare that the boy was tortured, they claim that they have been told this by a Sri Lankan army officer. However, in the transcript they show, it appears that, when they asked this officer how the boy had been treated, he simply responded ‘I got to know at the latter stages that they found out where Prabhakaran is through his son’. Then there is a description from a pathologist about how he had been killed, a description that uses the word ‘likely’ three times. This uncertainty is compounded in the response to the question Channel 4 posed about torture, having declared that ‘clearly’ whoever killed him was trying to get information. 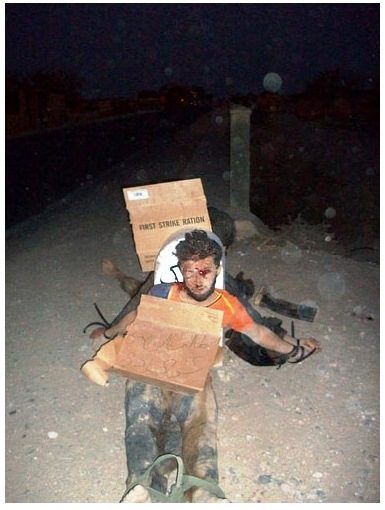 On January 15th, 2010, U.S. soldiers in Bravo Company stationed near Kandahar executed an unarmed Afghan boy named Gul Mudin in the village of La Mohammad Kalay. He was 15 yrs old. The answer is categorical that ‘There is no evidence on the body of physical torture’. However, the obliging expert then claims that ‘if we can imagine the situation he was in’, since there were five others ‘who may well have been killed before he was killed’, and (this is now definite in what we can imagine), he was shot ‘by someone standing in front of him with the end of the gun within a few feet of his body, that would be a psychological torture in itself’. 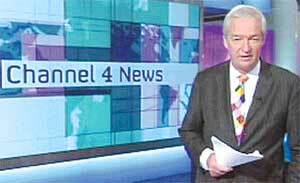 In this extraordinarily tentative world in which the Channel 4 expert lives, the alleged torture being characterized by a bizarre indefinite article too, this is enough to claim that President Rajapaksa is guilty. The sequence ends with the claim that, after several hypothetical steps, ‘the legal difficulties of linking the top to the bottom are largely eliminated’. I should add that this video does not seem, at first sight, to contain many of the flaws of the previous video Channel 4 showed, which was initially dated wrongly (with no explanation given when we showed that the metadata indicated something else), with no editing of fragments in the wrong order with the inclusion of one fragment filmed at a different time and perhaps even a different place according to the reports the UN commissioned, with no purportedly dead figure putting down his legs which led one apparently eccentric expert to declare that is was possible he was drunk or sleeping or playing dead while others were being shot through the head around him. The video of Balachandran’s body – not actual killing which was shown in the other video, which is bizarrely now connected to this through claims of a pattern – does not seem tampered with, which is why I believe the incident should be investigated. In the other case, it is obviously the video that should be investigated first, and for this we or the UN needs to have the original videos Channel 4 showed, not a copy as happened with the first video, when Channel 4 refused to give what they showed to us or to the UN. Channel 4 claimed to have received the initial video from a body called Journalists for Democracy, which is the same body that supplied the UN with another copy of that video, but one that differed in salient particulars that we had pointed out. And this time round, to strengthen their case against the Sri Lankan government, it is of course a representative of Journalists for Democracy who is trotted out. Those who do not know the involvement of this group in making the film in the first place would naturally be fooled, but it is sad that governments also refer to Channel 4 approvingly, without bothering to study the sleight of hand that is used. The third case history, as Channel 4 terms the four charges that are made, revolves around the claim that civilians were ‘knowingly targeted’. No evidence for this is presented, but instead we have a lot of emotive footage taken largely from Sri Lankan government footage, and then some generalizations that do not mention the reasons for the claims made. David Miliband asserts that ‘the fact that the LTTE were using civilians as human shields which in some cases they were, is itself a war crime, doesn’t justify the shelling of those sites and those individuals’. Sam Zarifi claims that ‘The evidence that’s available right now strongly suggests that war crimes occurred’, while William Shabas, described as a Human Rights Lawyer, claims that ‘There are strong presumptions, when these attacks took place, that they were disproportionate, that civilians may have been or civilian objects like hospitals may have been targeted’. No evidence is given for the claims or what the lawyer describes, with great circumspection, as presumptions. The claims are strengthened by the assertion that the pro-government media suggested no civilians had died in the offensive. On the contrary, what government spokesmen were denying was that civilians were targeted. As Shabas suggests, and as the United States and its allies have manifested time and time again, collateral damage is inevitable when targeting terrorists who live and work in the midst of civilians. The question is whether the force used was proportionate. The Americans always claim that the force was proportionate, by asserting that all those who were killed were terrorists, even though the poor Pakistanis and Afghans and others whose relations are killed think otherwise. But they obviously do not have the technological and other skills the West commands to identify as positively as the West does who is a terrorist, and to ensure that that identification is accepted by Western media. In Sri Lanka, we were faced with the fact that the LTTE deliberately placed heavy weaponry amongst civilians and in and near ‘civilian objects like hospitals’. This is clearly stated by those who cannot be said to have been prejudiced in favour of government in any way. 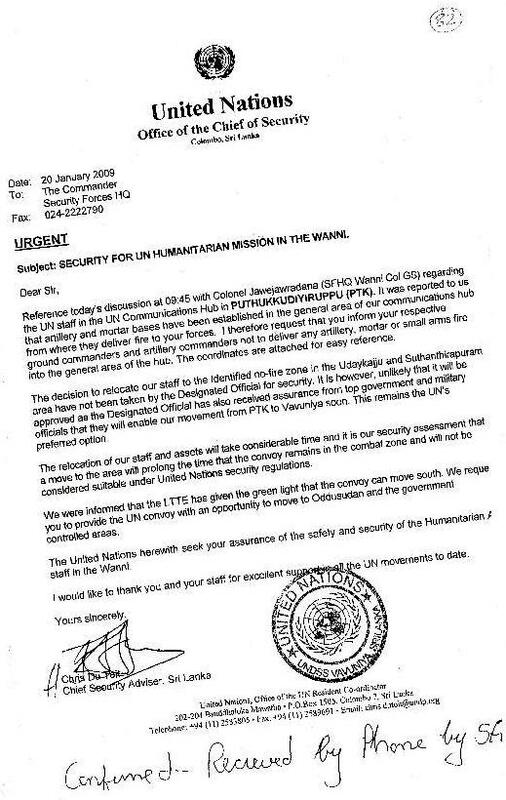 First there is the letter from Chris du Toit to the Commander of the Security Force Headquarters in the Wanni, dated January 20th, which was a few days after Convoy 11 went in. Du Toit wrote then, ‘It was reported to us that artillery and mortar bases have been established in the general area of our communications hub from where they deliver fire to your forces’. It must be remembered that the Convoy went in on January 16th and was meant to come out soon afterwards, but stayed on. At the time we were told that it was because they hoped to persuade the LTTE to let their staff in the North leave, though it is now insinuated that there was heavy fighting during that time. In fact fighting seems to have been limited, for in the four days between 16th January and the 20th, TamilNet alleged altogether 42 deaths from what they claimed were artillery barrages, in contrast to the large numbers alleged afterwards, when two figure and then three figure numbers became the norm. Certainly the forces were very anxious for the Convoy to leave, precisely because of what du Toit reports. When however the convoy did leave, part of it remained behind to continue to try to persuade the LTTE to free local staff, an exercise that proved fruitless even though we were told every day that success was imminent, and therefore declared ceasefires, which proved fruitless, except perhaps to allow the LTTE to redeploy its weapons. This is what happened on the day we were accused of targeting the humanitarian supply centre which forms the substance of Channel 4’s first case history. 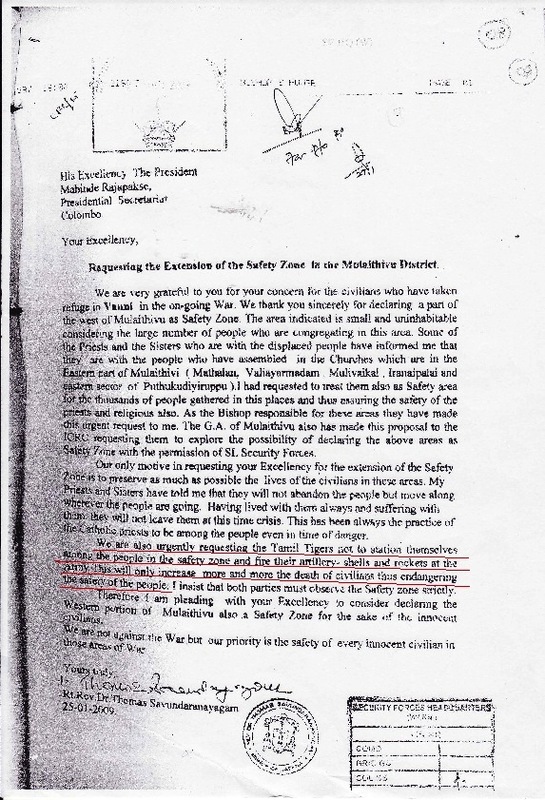 On that very day the Bishop of Jaffna wrote to government requesting it to enlarge the Safe Zone, and adding ‘We are also urgently requesting the Tamil Tigers not to station themselves among the people in the safety zone and fire their artillery shells and rockets at the Army. This will only increase more and more the death of civilians thus endangering the safety of the people. I insist that both parties must observe the Safety zone strictly’. 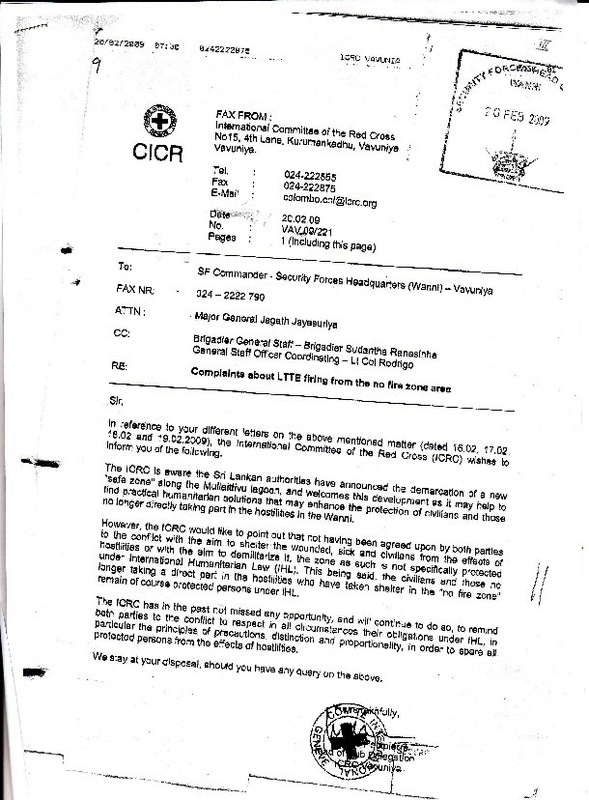 This was a request that the forces made through the ICRC too, which responded on 20th February, in a letter headed ‘Complaints about LTTE firing from the no fire zone’, welcoming the demarcation of a new ‘safe zone’ It added however that ‘the ICRC would like to point out that not having been agreed upon by both parties to the conflict with the aim to shelter the wounded, sick and civilians from the effects of hostilities or with the aim to demilitarize it, the zone as such is not specifically protected under International Humanitarian Law’. This is the crux of the matter, glibly ignored by those who sought political advantage through speaking up in a manner that would have helped the Tigers. David Miliband is right to say that ‘Democratic governments are held to higher standards than terrorist organizations’, though he was quite happy to connive in the programme of secret renditions and torture that Craig Murray, the British ambassador to Uzbekhistan who was dismissed for criticizing the excesses of New Labour, reveals. But it is also a fact that governments must defend their own citizens, and they certainly cannot allow their own forces to be mown down like flies, by refraining from firing on weapons which are targeting them. I cannot therefore understand Chris du Toit’s request ‘that you inform your respective ground commanders and artillery commanders not to deliver any artillery, mortar or small arms fire into the general area of the hub’ since he had just said that the forces were being fired upon ‘from artillery and mortar bases established in the general area of the hub’. The fact that not one single UN worker or member of a family was hurt then, and indeed – though most had to stay on to the end – none even thereafter, (except a girl who lost her leg because of a mine, if I remember aright, laid of course by the LTTE) is a tribute to the care exercised by our forces, in the face of this ruthless use of civilians, and even more prominently the UN officers who stayed on without proper authorization.